We just finished a three week Jazz and Art integration unit planned between Ms. B (the music teacher) and I. It was awesome!! The kids loved it, the teachers loved it and I hope you love it too. (4th and 5th graders at Randall were part of this lesson). In art class, we began by brainstorming about community. Students broke into groups to describe, analyze and interpret five photos I printed out showing communities in different parts of the world. They were told to write down all the describing words they could think of describing the photos. Then they wrote down their thoughts about the photos. We came together as a class to share out what each group wrote down and came up with a class list of what all the photos had in common. Next class, we listened to Duke Ellington’s Harlem and drew lines that made sense with the tempo of the music. Students then took those lines and interpreted them through body movements. It was a lot of fun to dance our lines and was a great opportunity to let creativity fly. Students partnered up to combine two of their line movement interpretations and perform their merged moves. The class described and interpreted their classmate’s moves through conversation. Students then went back to the medium of drawing to interpret their classmate’s movements back into a line drawing. At the end of class, students had a good understanding of how Romare Bearden was so inspired by music in his visual artwork. In the meantime, students were learning about call and response in music class with Ms. B and our artist-in-residence musician, Kevin Knapp. Students listened to Ella Fitzgerald’s rendition of A Tisket, A Tasket and searched out examples of call and response within the song. Over the next two music classes, students had a chance to learn about call and response through drumming and other percussion instruments. Kevin taught us that there is a caller and a responder. When the caller is playing something, we must listen carefully and reflect on what we hear and then respond with something that makes sense. Kevin played some C-Jam Blues on the piano and students would respond through their percussion instruments. In the third art class, students had their first experience with Romare Bearden and his artwork The Dove. Students had a class discussion on what they notice in this piece of art. Students watched this video by Picturing America and made connections between The Dove and Romare’s love for Jazz. The video talked about the large blocks of color Romare laid down as the background which can also be related to the beat or pulse of a song. And then how Romare showed the tempo or rhythm which is show as pattern in art. Students broke into groups and discussed how they would show community through their collages and then cut out images they thought they would use for their collages. We didn’t glue this day, just cut out and laid things out to experiment a little. The next class was all gluing. Students created a background to become the pulse of their collage. We talked about filling up the whole space and craftsmanship and then students just worked for two solid art classes on their collage creations. Then we discussed how to use call and response in creating a group collage. When one person lays something on the collage, the second person needs to look at it, think and reflect on it, and then respond with something that makes sense. What you are missing in the next blog post are the conversations students had through the art process. They were rich with ideas about so many ways to show community, what made sense together, laughter, silliness and some serious subjects. The collages themselves are amazing but their conversations and their experience working collaboratively were not to be missed. From here on out, it was all hands-on collage creating. See the results in the next post! Both Huegel second and third graders as well as Randall fourth graders created these beautiful stained glass windows inspired by nature just like Frank Lloyd Wright. We started with observational drawings of items from nature and then abstracted them into geometric shapes to create our symmetrical windows using line symmetry. 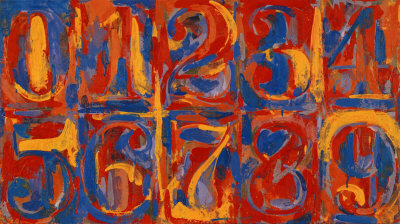 Jim Dine is really known for his heart images. 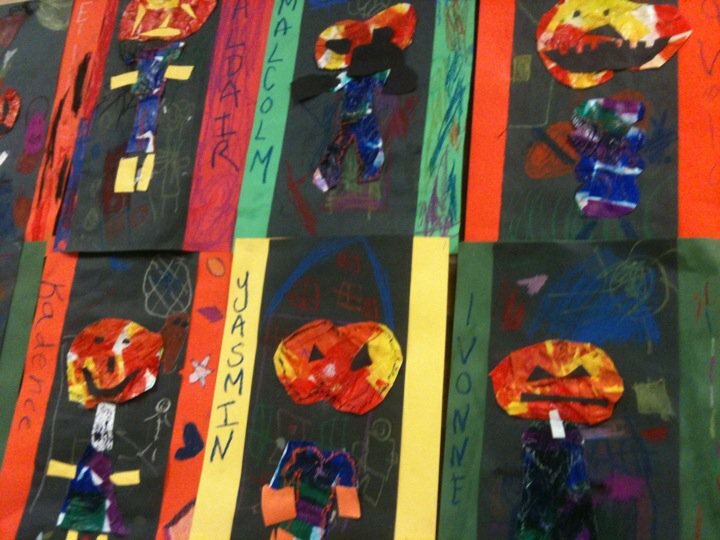 K/1 students created a multi media Jim Dine inspired art work. Students spent time in four different stations to create four different hearts. Then we let our hearts rest for the next art class. 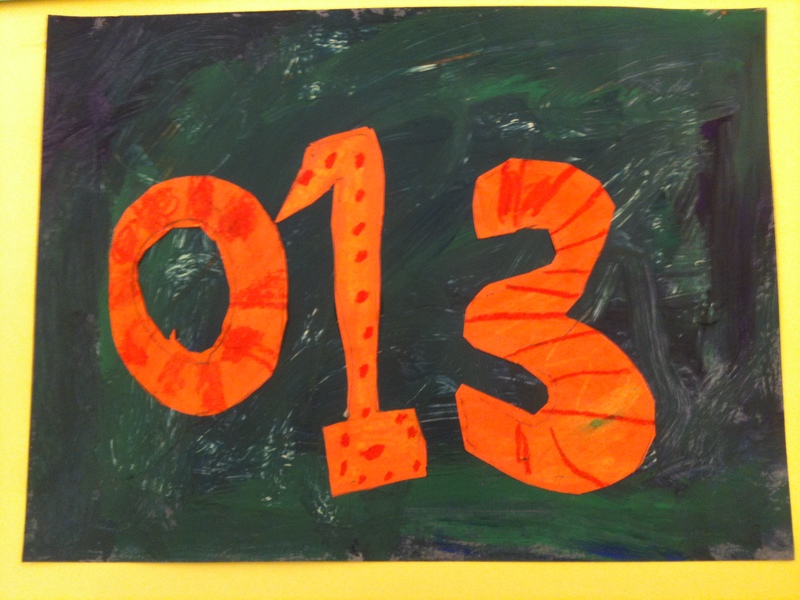 The second class period, students painted a background for their hearts. They also added in some texture as well. Here is the finished Jim Dine inspired art! I think they are beautiful and just in time for Valentine’s Day!! 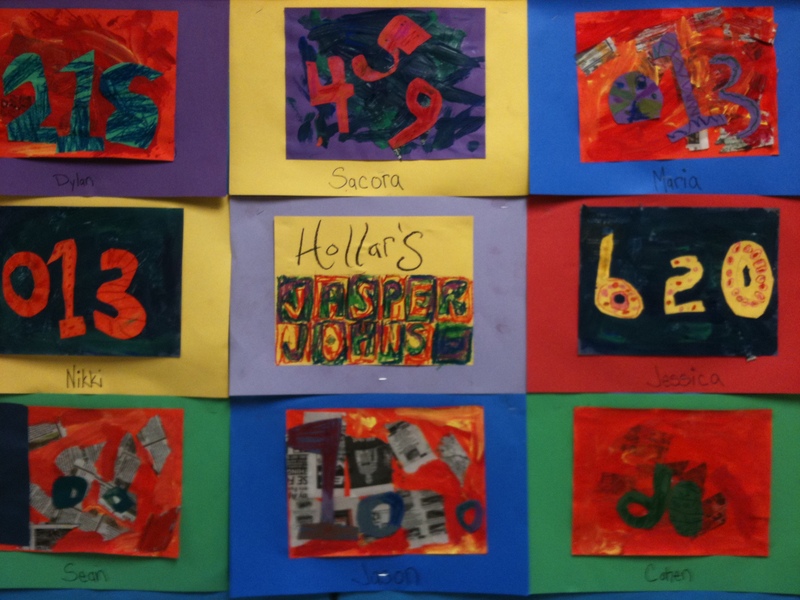 Kindergartners and first graders began by reviewing warm and cool colors while learning about artist Jasper Johns. 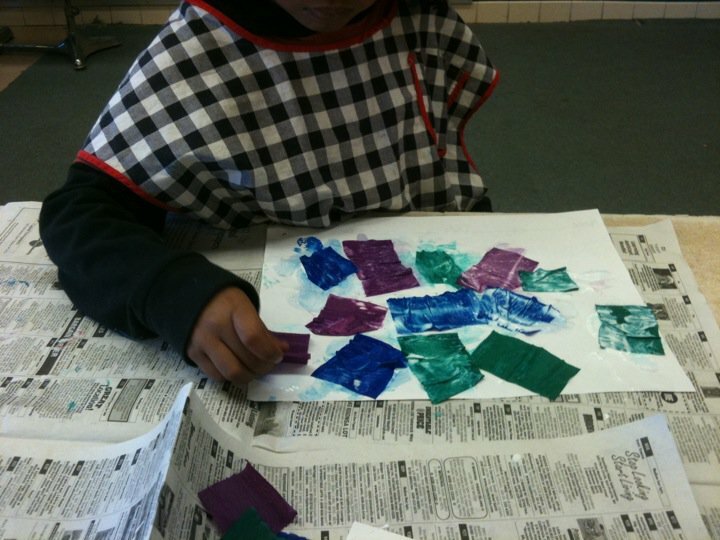 Students began by using Mod Podge and newspaper to create texture. Then chose a warm or cool color to paint their background. Kindergartners picked their favorite numbers and practiced tracing them. 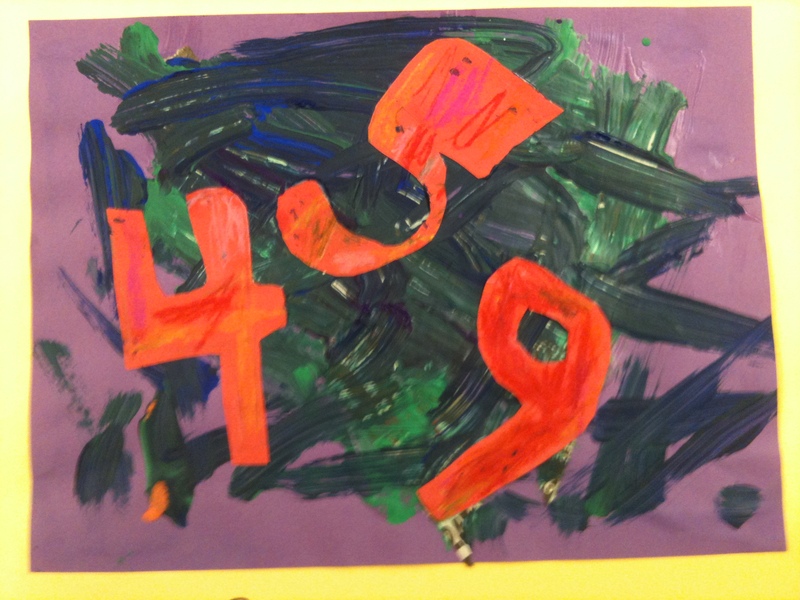 They chose three and used oil pastels (opposite color group of their background) to create pattern on the numbers, cut them out and glued them on their backgrounds. (First graders drew numbers free hand). Kindergartners and first graders learned that by using all these different art supplies in one project (mod podge, newspaper, paint and oil pastels) they created a mixed media art project. 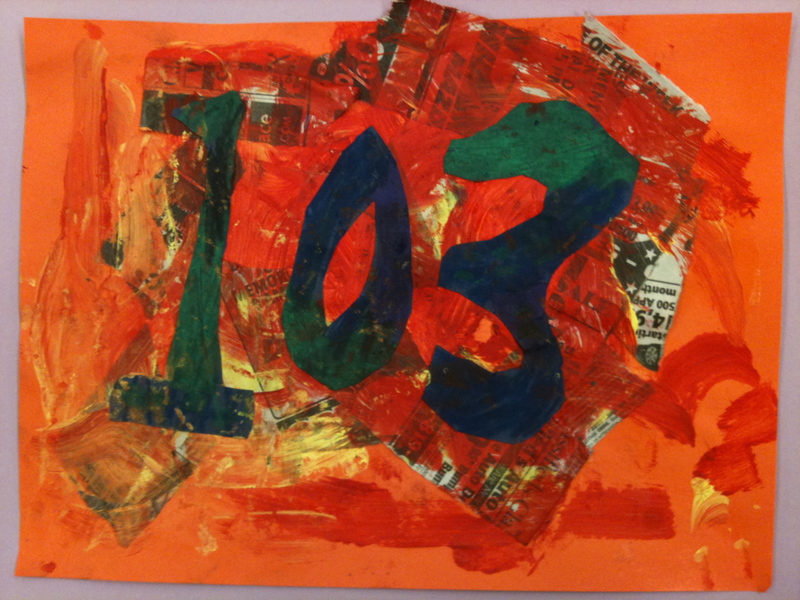 Lesson inspired by Jasper Johns and LaughPaintCreate. 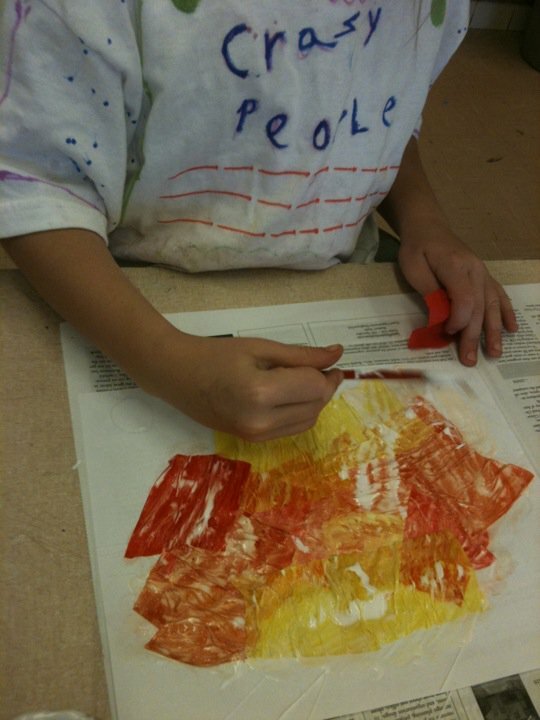 The Kindergartners and first graders have been busy learning about warm and cool colors by mod podging tissue paper. One sheet for warm colors (Yellow, Red, Orange) and one for cool colors (Blue, Green, Purple). 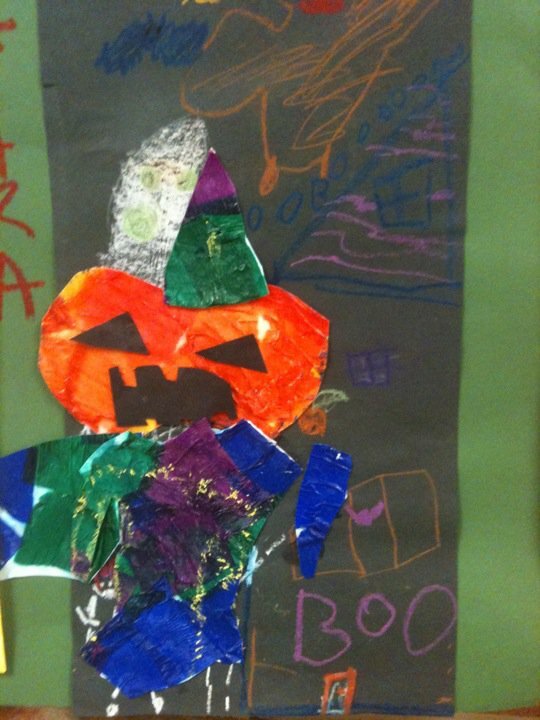 They took their warm color sheet and cut out a pumpkin head. 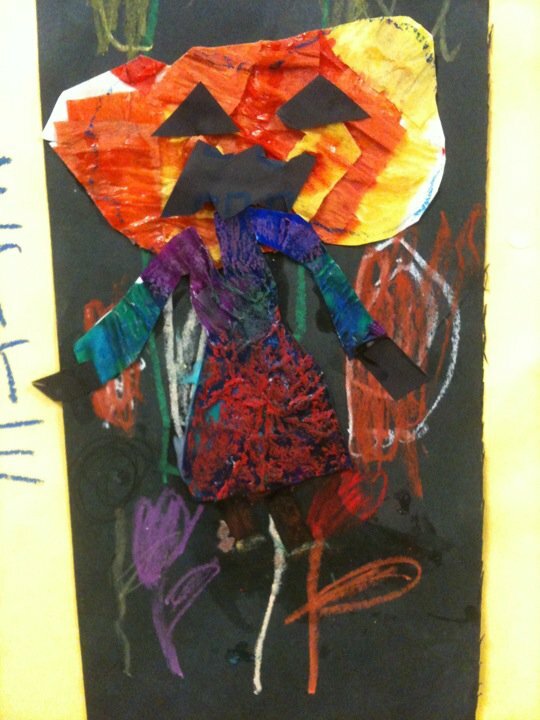 With the cool color sheet, they cut out clothing for their pumpkin people.